Sunset Resort’s legacy of welcoming guests to Washington Island is a 115 year ancestral journey. To understand the generations of passion and dedication the family has for the business, one has to travel with the founder, Torger Engelson, and share his vision as an early pioneer. The journey began when Torger left his native Norway in 1880 at age 20. After completing a four-year apprenticeship as a cabinetmaker, he was eager to work, but the country was experiencing an economic crisis, and scores of tradesmen, including Torger, left Norway to seek work in America. Chicago had been welcoming thousands of immigrants to help rebuild after the great fire, and it was a perfect destination for a trained woodworker. Torger prospered in Chicago for a decade. A year after Torger arrived in Chicago, he was re-united with his fiancé Anna Opdahl, who also emigrated from Norway. They were married a few weeks later. This marriage produced 5 children, one of whom died before his 6th birthday. Torger built a two-story home and lived a comfortable life until the building boom came to an abrupt halt and the nation faced a severe depression. Torger lost his Chicago home when his mortgage went into default after generously using his home as collateral to help a friend. In the summer of 1894, Torger, Anna and their children loaded household belongings onto a Goodrich steamship and left Chicago behind. This 4-day journey was shorter than the 7-day voyage from Norway to America, but the apprehension was just as great as he now had a large family to support and little money left. It must have been emotional for Torger as he first viewed the farmhouse and acreage he had recently purchased on Washington Island. With only a brief description of the land, and out of options, he had purchased the property sight unseen. The acreage was heavily wooded and the small farmhouse sat on top of a hill with an expansive view over Green Bay waters. But the ambitious Torger saw endless possibilities. His enthusiasm weakened temporarily when the family discovered their meager farmhouse had renters still in residence. With no temporary housing available on Washington Island, Torger and family traveled to nearby St. Martin Island and for ten days stayed in a vacant cabin until the tenants vacated. Torger is holding a fish in his right hand and standing below the porch. Anna is just behind him with Martin just visible to her left. Annie is sitting down with her legs crossed and one foot jutting through the porch spindles. To her left is Tillie and Willie is sitting on the porch railing. On their return to Washington Island, Torger wasted little time utilizing the natural resources. He started farming, set up a saw mill, sold cord wood to passing steamers and helped build Plum Island Station. Next, he began a successful and enduring commercial fishing business. After a few years, he had the 41 foot fish tug Tille E. built to his design specs. Anna tended to her garden, the children, the animals, and mended nets into the night. She shared her husband’s spirit and drive. With word spreading that the Island was a scenic and peaceful spot to vacation, accommodations were needed to meet the recent demand of visitors. Never missing an opportunity, in 1900 Torger began a large two-story addition. 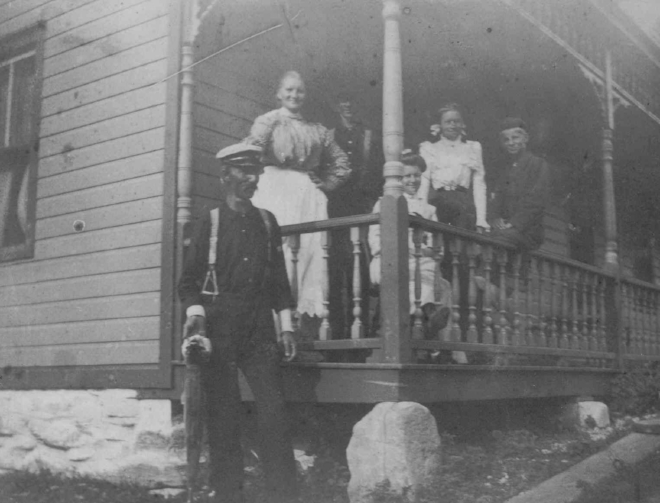 In 1902, Torger and Anna Engelson became innkeepers and welcomed their first guests to what they called Pine Beach Retreat. Early visitors included school teachers who stayed all summer. The rate was $1 a day and included three meals. Daughters Tillie and Annie helped their mother cater to the guests, while sons Martin and Bill worked with Torger in his fishing business, now spanning the beach with a warehouse, net sheds and a large dock. 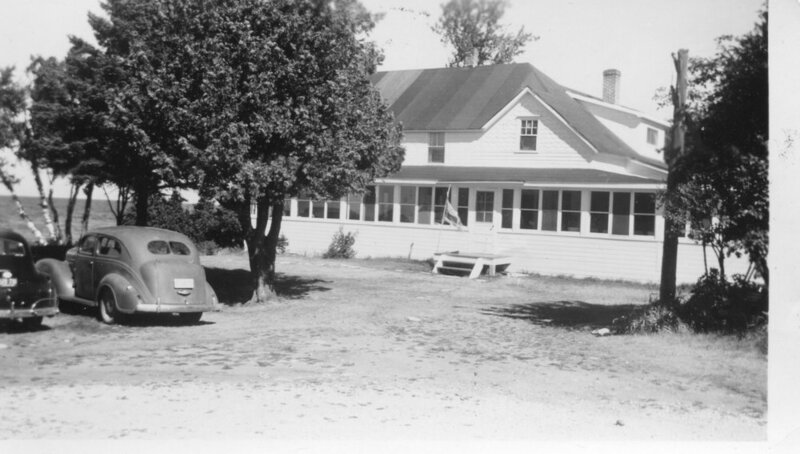 Pine Beach Retreat thrived for 25 more years as the children grew up and had families of their own. In 1924 Torger moved his family and fishing operations to Kenosha, a relatively ice-free port. During the summer, he fished out of West Harbor while Anna & the girls operated Pine Beach Retreat. After the passing of Torger and Anna, their youngest son, Bill and his wife, Dora inherited the Island property and moved back in 1938. They wasted no time making improvements to the west shore property. Soon kerosene lamps were replaced with a generator for electric lights. Chamber pots and wash basins were traded for flush toilets and showers, and a name change was needed, worthy of the new modern inn. Sunset Resort said it all, and they could now charge $2.50 per night, including three meals. It was a joyous era for Sunset Resort and Bill and Dora were congenial hosts. Their grandchildren roamed the grounds and beaches and swam and fished every afternoon with friends and guests. The guests became family, often staying at least a week and returning year after year. 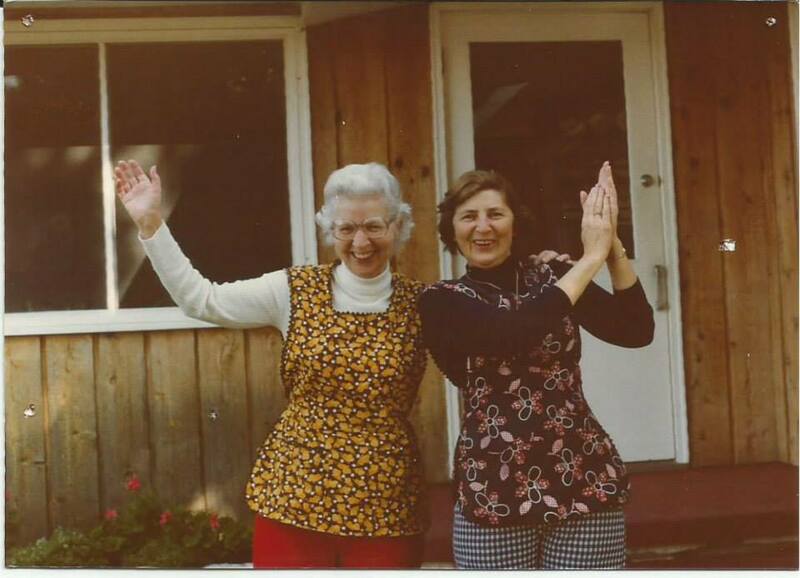 After the passing of Bill and Dora Engelson, their daughters Maxine Engstrom and Lois Hagen became partners in the business in 1960. With years of training, the transition was seamless as they carried forward the high standards set by their parents and grandparents. With encouragement from their children, Maxine and Lois took on large remodeling projects. All guest rooms were enlarged to accommodate private bathrooms. The dining room was also enlarged to include large windows overlooking the bay. They added new personal living quarters and gave Sunset an upgrade while leaving reminders of the past tucked in every corner. The fourth generation of the family was clearly in the picture throughout the partnership and was well-prepared to take the reins as Maxine and Lois began their retirement years in the late 1980’s. Both of Maxine’s children, and all of Lois’ children played a part in bringing Sunset Resort to the present, where you will find the 4th, 5th and 6th generations of Engelsons working together to carry on Torger and Anna's traditions. Sunset Resort guests still gather each evening to share the same magnificent view which Torger, Anna and their family first witnessed in that summer of 1894.